Worlds Day Two - Oooops! The 2018 Etchells World Championship Race Committee has been pretty clear about it. They have lost the last two mornings to ultra-light and variable winds, and they want to run the best series they can until Saturday 1500hrs, when they can set no more races away. Nine in total would be ideal, seven makes for good times, and six is acceptable. You could call it a mission. So when they sent the fleet away to the course from the shore after being held on land for an hour and a half, it was a fair bet that Code Flag U would be deployed. After waiting for the continual flicks in the breeze to settle down, and the resultant course axis changes from 025 to 050 degrees, it was also somewhat evident that just the one race was on for the day. Course One was designated, meaning an extra leg back to windward for the finish, but there was a long way to go before that. There was a strong tide running out of Moreton Bay from South to North and this would turn back in the middle of the afternoon. Any chance of it becoming a true Nor’easter was cast adrift when the Easterly aspect won the day, but it settled in for a good 12-knot type affair, which is pretty much ideal. It would clock even further right for the finish, with a course change to 060 degrees as the direction for the crews to find the Committee Boat and finish pin. Alas, nine boats did not get to partake in today’s on water festivities, for they broke the start (OCS). One of these was yesterday’s winner, Havoc, which will be devastating for them, but they will put it behind them now, for sure. 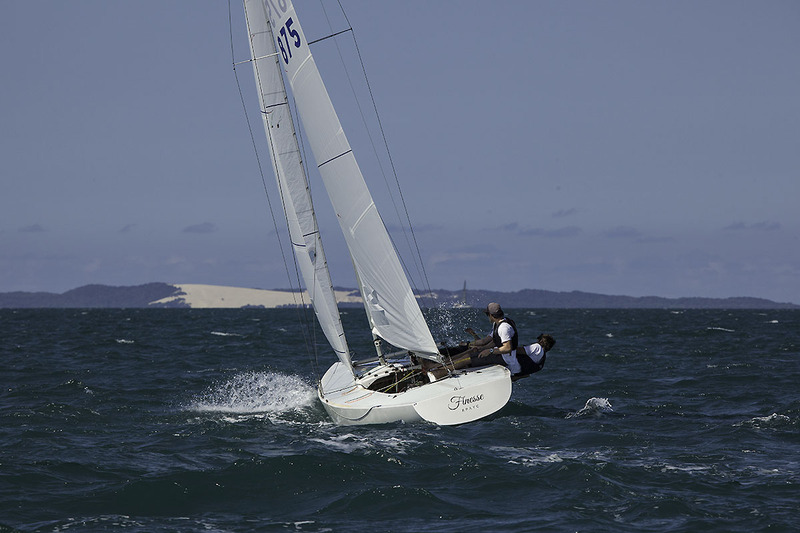 It also means that with a pair of second places now, Lisa Rose (AUS 1449), which is Martin Hill, Sean O'Rourke, Julian Plante, and Mat Belcher, have a very tidy lead at the top of the table. Etchells racing can be snakes and ladders, so they will be very focussed on achieving some more very handy podium finishes in the days to come. However, winning the day, after a slowish start was, Tango (AUS 1440). Class Governor, Chris Hampton, with crew Sam Haines and Charlie Cumbley are no strangers to the podium, and were happy with their day’s work, and even quicker to remind me that this World Championship is a long way from done, just yet. Apart from the win today, they also climb into second place overall with 16 points, 12 adrift of Lisa Rose. “Hopefully we can repeat some of clean starts that we had in the Pre-Worlds last week from tomorrow on”, said Hampton in closing. Also on 16 points overall tonight is Iron Lotus, who won the Pre-World title last week. Following them are a number of crews in the high teens to low 20s, including Hong Kong’s Mark Thornburrow with his Racer C crew, and from the USA, Jay Cross’s Skanky Gene crew, and Jud Smith (USA) helming, Roulette. 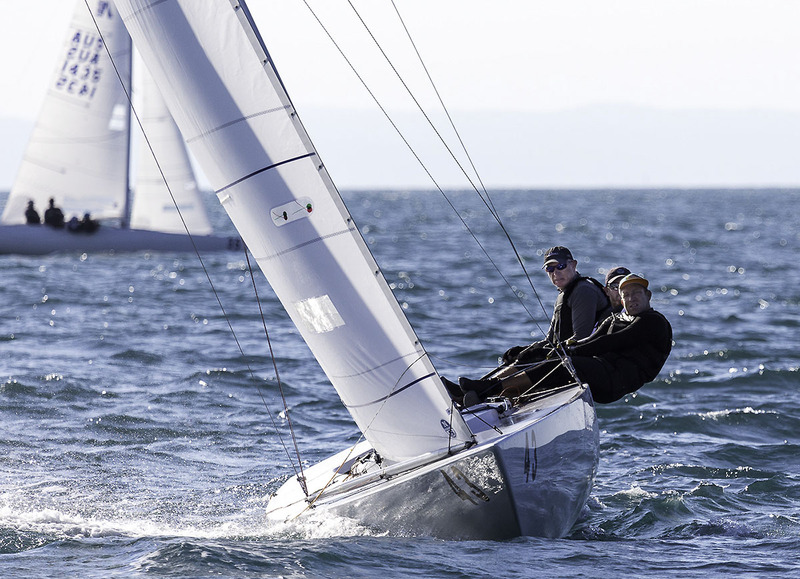 Tom King, Ivan Wheen, David Edwards and Greg O’Shea on Iron Lotus won the Pre-Worlds last week, and the first three of them also the 2012 Etchells World Championship. Tonight they are in third place on equal points with Tango, but third on countback. They too had an even better day today with a fourth place, not that a 12th place yesterday was anything other than terrific. Racing continues tomorrow, Wednesday October 24. 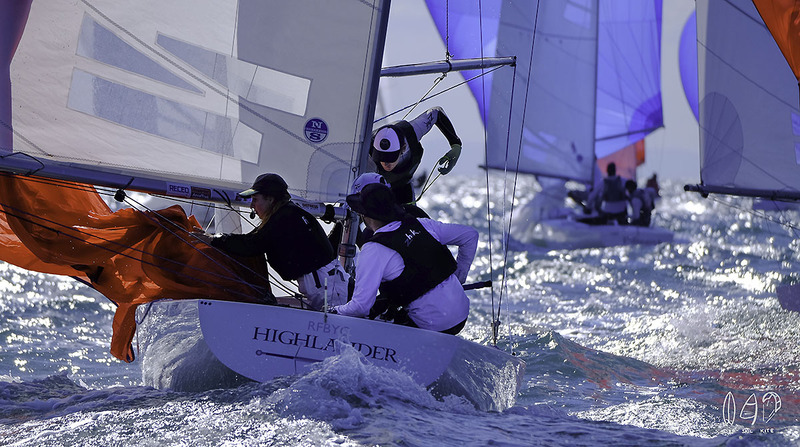 The Royal Queensland Yacht Squadron in the Brisbane suburb of Manly will host the 94-boat strong armada for the 2018 Etchells World Championship, as they tussle it out to see which crew reigns supreme. Racing begins in earnest on Sunday October 21, and concludes on Saturday October 27. Now to find out all you need to know about the boats, on the water, off the water, or to register to receive news, simply go to 2018etchellsworlds.org and click away!